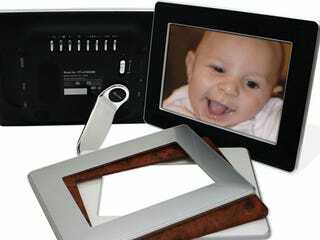 If all digital photo frames are starting to look alike, try this Mustek PF-A1020BC with its big 10-inch LCD and swappable frames, coming with silver, "frosted white," or Mahogany faceplates. Pictures should look pretty nice as the 9.5-inch viewable area displays at a 720 x 480 resolution, and you can store around 45 JPEGs thanks to the frame's internal memory. But are the pretty colors going to be able to justify the frame's $200 price tag? It's not as radical as some of Mustek's previous offerings, though it doesn't do less than the competition: MP3s, slideshows, and direct transfer from a USB drive or memory card are all supported. If you're still in the market for a digital photo frame, the PF-A1020BC is certainly one to look at. Keep an eye out for them this summer.